There is a long history of producing Kosher Bordeaux wine. 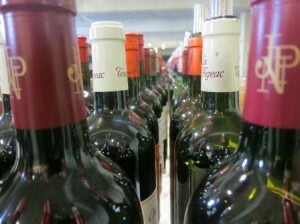 However, due to the difficulty of production and a lack of demand, Kosher Bordeaux wine remains a niche product. A myriad of chateaux in every region has endeavored to produce Kosher Bordeaux wine from time to time. Some estates continue to make a small amount of Kosher wine, other properties have only made a Kosher Bordeaux in a single vintage. Numerous Bordeaux chateaux have made Kosher wine. In fact, at various times, almost 50 different estates have made Kosher Bordeaux wine. While there are some large 1855 Classified Growths that make Kosher Bordeaux wine, most of the estates producing Kosher Bordeaux wine are small. In fact, the majority of estates that producer Kosher Bordeaux wine sell their wine as generic AOC Bordeaux. Kosher Bordeaux wine is produced all over the Bordeaux appellation. Chateaux in the Left Bank, Pessac Leognan, Pomerol, St. Emilion, Sauternes and the various Satellite regions all make Kosher Bordeaux. Several Kosher Bordeaux wines comes from the Entre Deux Mers appellations in The Right Bank. It is also important to note, that Kosher Bordeaux wines are not just produced from small vineyards, you are not familiar with. As you can see from the list of Kosher Bordeaux producers below, some of the best chateau in Bordeaux produce small amounts of Kosher wine. We’re talking Second Growths, Premier Cru Classe and Grand Cru Classe wines! Simply put, for a Bordeaux wine to be Kosher, the production of the wine during the vinification process must at least observe the Sabbath or even better, be a Rabbi. Plus, all the ingredients used during the vinification also need to be Kosher, for example, the yeast needed for the fermentation and the egg whites for the fining. Before we get further in this explanation, it’s important to note, that because grapes are a product of nature, the need for Kosher supervision does not take place until the vinification begins. To produce Kosher Bordeaux wine, it would appear that you have two main issues revolving around additives to the wine which can lead to Bordeaux wine that is Kosher to drink, but not Kosher for Passover. The inverse is impossible, as Kosher for Passover wines are innately kosher all year round. The reason is, Passover wine for observant Jews has its own set of rules starting with that for Passover, leavened products, or leavening agents are forbidden. This can be a problem for many wine makers. The second issue is Kitniyos, which is a Jewish law stating that any food substances that resemble any of the five grains that are produced by leavening cannot be eaten on Passover. Yeast is of course required for fermentation, as yeasts are needed for the process of turning grapes into sugar which makes the wine. Grain yeast cannot be used for Passover, which is why observant Jews do not any leavened bread or similar grains during the Passover holidays. Naturally, some yeasts are a problem. However, it is perfectly fine to use either wild, natural yeasts during the fermentation process or special Kosher yeasts. Some acids can also pose problems, as well as certain sugars, tannins and fining agents. Once the chateau has made it that far, it gets more difficult. Only an Orthodox Sabbath observant Jew is allowed to handle the grape must, juice, wine and French oak barrels. Only an Orthodox Sabbath observant Jew is allowed take care of the elevage process, (Pumpovers, Racking etc.) and to handle the wine during the blending and bottling as well. For very observant Jews, as you now know, not only did the wine maker need to be a Rabbi or Sabbath observant Jew, the person or sommelier serving the wine must also be a Rabbi or Sabbath observant Jew. If a Rabbi or Sabbath observant Jewish person was not involved and available to supervise the wine making process and the serving, then the winemaker can opt to use a flash pasteurization process, heating the wine to between to between 180 to 195 degrees for a short time, which makes the wine fine for dinners requiring a Kosher wine. This is called Mevushal. When looking for a Kosher Bordeaux wine, to make sure the bottle you are buying is Kosher, read the back label. It will either state in writing on the label that the wine is certified Kosher, and or, could also display the letter K for Kosher, or P, which states that the Kosher Bordeaux Wine is fit for service during the Passover holiday. This is a list of all the chateau that have produced, or currently make Kosher Bordeaux wine. Not every estate on the list continues to make Kosher Bordeaux wine. Some wines are not produced every vintage. You should check with your local wine merchant, or ask the specific estate to see if they have Kosher wine available, should the need arrive to purchase Kosher Bordeaux wine. If you know of any other Kosher Bordeaux not on all this, please let me know, and we will gladly add it to this page.